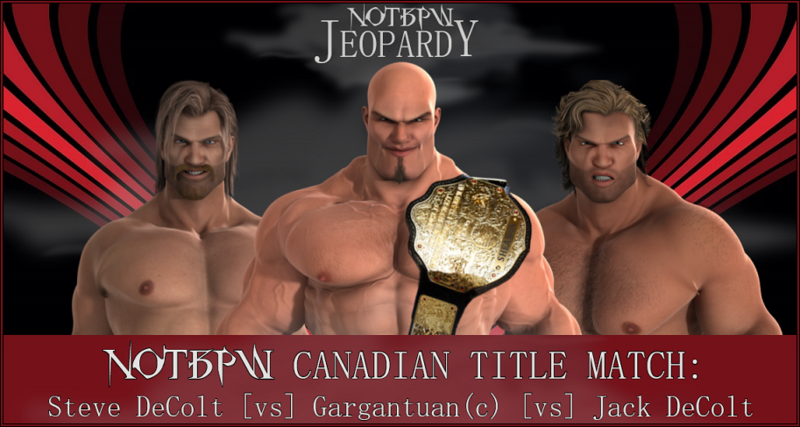 'Jeopardy'... the pay-per-view formerly known as 'Jeopardy In June', was moved back to July in 2017 for NOTBPW's new look like up of events for the year... and tonight we have a packed show ahead of us... 'The Monster' Gargantuan will defend his NOTBPW Canadian Title, and his undefeated streak, in a Triple Threat Match against two legendary DeColt competitors: Steve DeColt and Jack DeColt!! If anyone can take 'The Monster' down, it's the two brothers... But are they on the same page...?! They don't exactly have a great recent history as friends... We will also see the 'Best in the World' Sean McFly wrestle his final match in NOTBPW... But before we get to those two huge Main Events, we had a packed under card... Including the opening six-man tag team match!! These six talented competitors had a back and forth battle here, with lots of near falls for both teams. The Ring Generals (Dean Waldorf and Marv Statler) used quick tags to keep a man fresh, while using Ernest Youngman as the powerhouse to keep their selected opponent in their corner. Their selected opponent was the least experienced of the three: Solomon Gold. The new tag team partner of The Natural was in trouble for a while, Youngman, Waldorf and Statler almost pulling some of his limbs from their sockets! He was finally able to tag in the veteran The Natural though, and then Sonny Wildside was also brought in by his teammate! Wildside was on fire tonight, and he kicked lumps out of all three of his opponents. In the end, The Natural sent Statler and Waldorf over the top rope. Youngman threw Natural into the ring post. And then it was Wildside's turn to dominate. He super kicked Youngman under the chin and stunned him, before heading to the top rope to hit his brilliant 'Fear Factor' finisher! Aaron Andrews has had mixed success levels in his short NOTBPW career; particularly in the 'big' matches, he's struggled to string victories together. Tonight he was up against a vicious fighter in 'Shooter' Sean Deeley, who has made life very difficult for all of his opponents in 2017. It could be argued that he has also struggled to pick up wins in big matches. This one was as even as it could be in terms of nearfalls, but Deeley had the lions share of the offence for most of the match. Andrews withstood a barrage of abuse, and was eventually able to hit his 'Flying Body Press' from the top rope to pick up the win! But nobody could have predicted the man that DID come out!!! Former two-time NOTBPW Tag Team Champion, and a former Ed Henson Memorial Tag Team Cup Winner... Everyone thought he'd taken some time off when his tag team partner got hurt, but THRILL SEEKER only took one month off TV following Jacob Jett's career threatening injury!! Tonight, he was ready to make a huge impact!! Thrill Seeker was very impressive tonight, despite being up against a man that outweighs him by 80lbs! Tim Westybrook's reach advantage was also key in the opening stages, as numerous lock-ups ended with the big man in control, and fist fights also weren't productive for Thrill Seeker. His only choice was to stick and move, and he began delivering low kicks to Westybrook's hamstrings. Westybrook didn't know what to do to handle the stinging strikes. He could barely stand up after Seeker got to double figures, but he was still able to deliver a brutal lariat! Seeker did a backflip and landed on his front, but both men fell to the floor. From then on, it was a close match. Both men hit offence, and were able to create chances to win the match, but Seeker had the wind knocked out of him by another lariat, and then unfortunately walked onto a 'TNT Whirlwind' and was pinned. Tim Westybrook knew he'd been in a fight though! In the absence of Dan DaLay... his tag team partner Derek Frost and his son Robin DaLay headed to the ring together... The veteran Frost grabbed a microphone, and told the fans that with DaLay's injury, the tag team Bad Reputation were OUT of the Tag Team Title Match against Cameron Vessey and Christian Price... But... Frost HAD lined up a replacement team... It'll be Robin DaLay, teaming up with an old friend from Developmental, known simply as 'Logan'...!! Robin DaLay and his tag team partner Logan were a threat tonight. The two youngsters gave a good showing of themselves against the very experienced Cameron Vessey and Christian Price. DaLay lived up to his surname tonight, using his power and explosiveness to keep Vessey and Price at bay. Cameron Vessey knows a thing or two about being a second generation star though, and he used dastardly, underhanded tactics to gain an unfair advantage over DaLay! From then on, Vessey and Price dominated the match, and kept DaLay in their corner. Logan was desperate to get in the ring, and he eventually got his chance. He exploded into life and changed the momentum of the match! It didn't take long for him to run out of steam though, and Vessey and Price took control again, 2 on 1! Robin DaLay was absolutely no help, and neither was the 'cheerleader' Derek Frost, as he was jumped out of nowhere!!! Mutant and Aldous Blackfriar arrived on the scene, and Frost was taken out!!! Logan then walked onto a 'Stud Stopper' Stunner from Christian Price and was pinned! Robin DaLay, Logan and Derek Frost were easy pickings for Aldous Blackfriar and his 'muscle' Mutant... Cameron Vessey and Christian Price celebrated on the ramp, with Vessey sat down, his leg troubling him somewhat... Blackfriar and Mutant had already double teamed and taken out Frost, and then turned their attention to Robin DaLay... They slammed the youngster into the ring steps, before climbing slowly into the ring and circling the newcomer Logan... Aldous locked Logan in his 'Gloomweaver Clutch' (head squeeze) and squeezed the energy out of Logan... They left him lifeless in the ring, before walking off and stepping over Derek Frost's lifeless body too!! Undefeated. James Hernandez is undefeated in all matches since March of this year, except for the Super Slam Battle Royale! Four months, he's not lost a match, and he's looked very impressive in every outing. 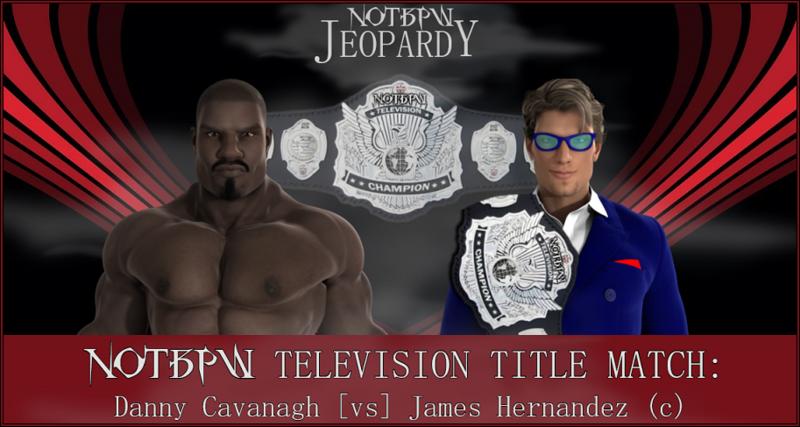 Tonight, the 'Mainstream' NOTBPW Television Champion was up against a much larger opponent in 'Mighty' Danny Cavanagh. Cav is a fan favourite too, but tonight the fans got on his back for the way he treated their beloved Champion. He didn't care, he was out to become Champion himself. Hernandez was on the back foot for most of the match, with the crowd getting restless in expectation of seeing a comeback, but the longer the match went, the more likely that comeback just wouldn't happen. In the end though, Cavanagh got a little too cocky, and allowed Hernandez to hit multiple super kicks to keep Cav at bay! Cavanagh was stunned, and it didn't take long for Hernandez's long-awaited comeback to be fully effective, when he hit his 'Apparition #14' Spear! Sean McFly headed out to the ring second here, in his final match in NOTBPW. He was wearing dark coloured jeans, with kneepads on the outside, and a tight black t-shirt with 'Best in the World' emblazoned across the front in white text! 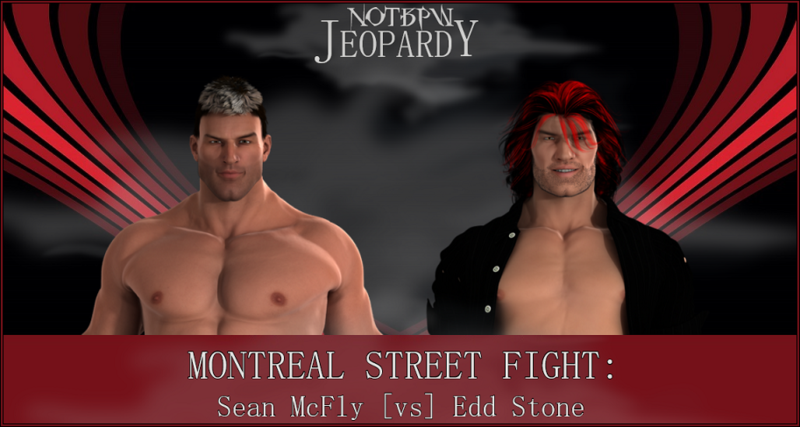 Edd Stone was in his wrestling gear, but this 'Montreal Street Fight' was never going to be a wrestling match! The bell rang, and McFly flew at Stone, taking him down with a double-leg, and then hitting him with multiple right hands! Edd Stone suffered a cut lip very early on in the match, following a forearm smash from McFly, and it was a brutal fight from then on. Stone attempted a few low blows, but McFly kept countering it, and attempted arm bar submission holds! But Stone was relentless in his efforts, and eventually found some success with a big low kick that the referee was furious about! He could do nothing though, because there were no rules, and as McFly writhed around on the floor, Stone went for the hardware! Tables, chairs, a baseball bat, and kendo sticks were all brought into play by the young Stone Brother, and he attempted to use them ALL on McFly! Considering the fact that Sean McFly is Edd Stone's Brother-in-law, 'The Animal' treated him with a lot of disdain. Related or not, Edd had one thing in his mind tonight, making McFly bleed, and making him pay for what Edd sees as crimes against wrestling. As the 'Best in the World' McFly is able to adapt to most situations though. He countered a chair shot with a hard kick to Edd's left knee and set about trying to find weapons that he could wield himself. He finally found what he was looking for: A piece of 2x4 wrapped in barbed wire! But he wasn't finished there. He reached under the ring, and grabbed a cigarette lighter!! The bit of 2x4 must have been doused in petrol, because it went up in flash!! McFly nearly burnt his arm off, but he slowly climbed onto the apron, ready to climb in and confront Stone. But the crafty 'Animal' had grabbed a counter weapon: A fire extinguisher! He fired it at McFly, and blinded him, while putting the flaming 2x4 out! Stone attempted a spear through the ropes, but McFly JUST saw him coming, and managed to deliver a knee to the side of Stone's head! McFly grabbed his attacker in a front facelock. He then dropped backwards off the apron, and DDT'd Stone through a table!! The veteran landed hard himself, but he was able to roll an arm over onto Stone's chest, and the referee counted to three!! 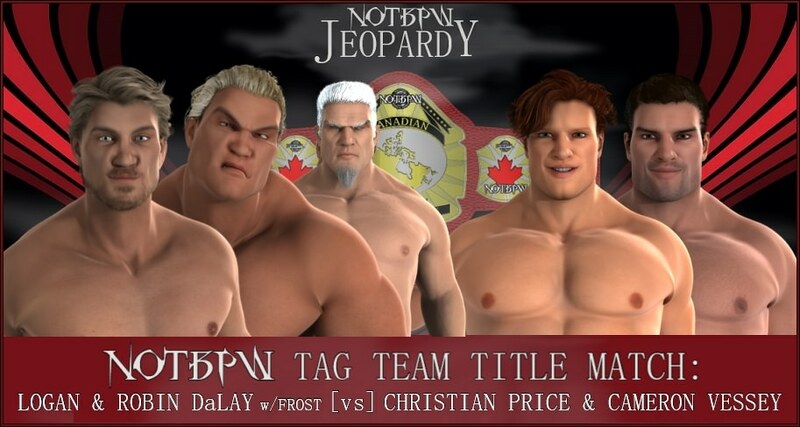 Main Event time... A Triple Threat Match for the NOTBPW Canadian Championship... The undefeated Champion Gargantuan will defend against two DeColt brothers: Steve and Jack DeColt... In recent weeks, the two brothers have been in agreement that the best way to stop 'The Monster' is to team up, and take him out together... Just like the old days... 'The Outsider' and 'The Wild Man'... But how can they co-exist...?! It's been over fifteen years since they won the CGC Tag Team Titles together... Can they re-capture their chemistry for one night, and keep Gargantuan down for long enough to fight to the finish and have one of them become Canadian Champion?! Everyone who enters the ring with 'The Monster' Gargantuan has a great plan, until they enter the ring with 'The Monster' Gargantuan. The DeColt brothers wanted to team up and take him out, but after a punch to Jack DeColt's nose, followed by a huge lariat to Steve DeColt, put the kibosh on any plan they had. For the next few minutes they didn't get a chance to work together. Gargantuan just went between one opponent and then the other, beating and clubbing them both to the ground. Eventually though, Steve DeColt rose up and began fighting back! He punched Gargantuan in the side of the head, he kicked 'The Monster' in his hamstring, and he chopped the undefeated Canadian Champion across the chest! Steve DeColt was in charge, but when he looked to Jack DeColt to get up and help him, 'The Wild Man' was down in the corner, clutching his mid-section after being drilled with a knee from Gargantuan. Steve needed some help, but he didn't get any. With Steve DeColt laying into Gargantuan in the opposite corner, Jack DeColt looked hurt, but he somehow found the strength to leap up at the opportune moment and blast his brother in the back of the head! Jack then continued to 'play possum' on the outside of the ring, while Gargantuan regained his composure and entered into a fight with Steve DeColt. It looked like an even fight, but the crafty Jack DeColt was ready to pounce when he saw his opportunity again! He flew into the ring and chopped Gargantuan down at the knees, before delivering his patented 'End Of Days' finisher to Steve DeColt! Jack hadn't done nearly enough damage to Gargantuan though, and the big man lifted the former Canadian Champion up by his throat. Jack kicked and scratched, and managed to escape Gargantuan's grasp. However it wasn't long before Jack was back in 'The Monster's' death grip! Gargantuan hit a Chokeslam on Jack, ONTO Steve DeColt, and then threw Steve out of the ring. He waited for Jack to get to his feet, and then he popped him up in the air and delivered the unstoppable, unbeatable, 'Ultimate Backbreaker'!